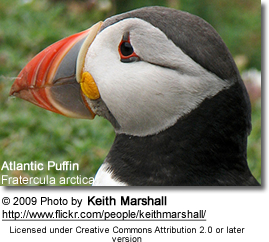 The Atlantic Puffin (Fratercula arctica) is a seabird in the auk family. It is a pelagic species that feeds primarily by diving for fish, but also eats other sea creatures, such as squid and crustaceans. Its most obvious characteristic is its brightly colored beak during the breeding seasons. 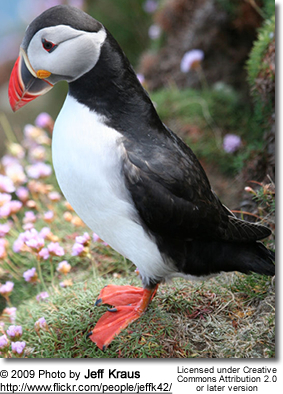 Also known as the Common Puffin, it is the only puffin species which is found in the Atlantic Ocean. The curious appearance of the bird, with its colourful huge bill and its striking piebald plumage, has given rise to nicknames such as "clown of the ocean" and "sea parrot". 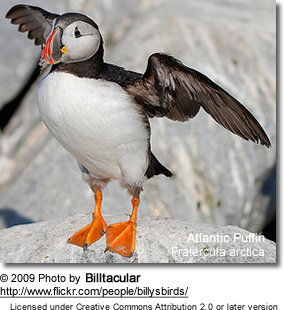 The Atlantic Puffin is 28–34 cm (11-13.5 in) in length, with a 50–60 cm (20-24 in) wingspan. The male is generally slightly larger than the female, but they are colored alike. This bird is mainly black above and white below, with gray to white cheeks and red-orange legs. The bill is large and triangular, and during the breeding season is bright orange with a patch of blue bordered by yellow at the rear. The characteristic bright orange bill plates grow before the breeding season and are shed after breeding. The bills are used in courtship rituals, such as the pair tapping their bills together. During flight, it appears to have grey round underwings and a white body; it has a direct flight low over the water. The related Horned Puffin (Fratercula corniculata) from the North Pacific looks very similar but has slightly different head ornaments. Predators of the Atlantic Puffin include the Great Black-backed Gull (Larus marinus), the Great Skua (Stercorarius skua), and similar-sized species, which can catch a puffin in flight, or pick off one separated from the colony. Smaller gull species like the Herring Gull (L. argentatus) which are hardly able to bring down a healthy adult puffin, take eggs or recently hatched chicks, and will also steal fish. 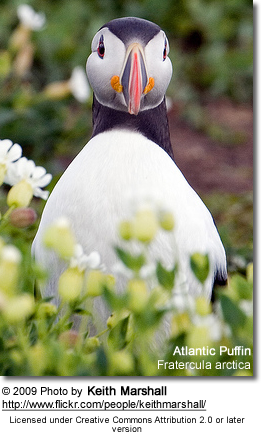 Atlantic Puffins are colonial nesters, using burrows on grassy cliffs. They can face competition from other burrow nesting animals such as Rabbits, Manx Shearwaters and occasionally Razorbills. They will also nest amongst rocks and scree. Male puffins perform most of the work of clearing out the nest area, which is sometimes lined with grass, feathers or seaweed. The only time spent on land is to nest. Mates are found prior to arriving at the colonies, and mating takes place at sea. The Atlantic Puffin is sexually mature at the age of 4–5 years. The species is monogamous and has biparental care. A single-egg clutch is produced each year, and incubation responsibilities are shared between both parents. Total incubation time is around 39–45 days, and the chick takes about 49 days to fledge. At fledging, the chick leaves the burrow alone, and flies/swims out to sea, usually during the evening. Contrary to popular belief, young puffins are not abandoned by their parents (although this does occur in some other seabirds, such as shearwaters). 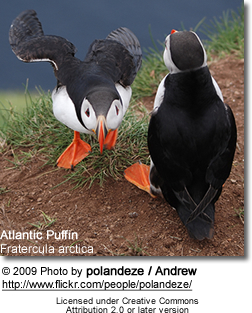 Synchronous laying of eggs is found in Atlantic Puffins in adjacent burrows. Feeding areas are often located 100 km (60 mi) offshore from the nest or more, though when provisioning young the birds venture out only half that distance. Atlantic Puffins can dive for distances of up to 70 m (200 ft) and are propelled by their powerful wings, which are adapted for swimming. They use their webbed feet as a rudder while submerged. 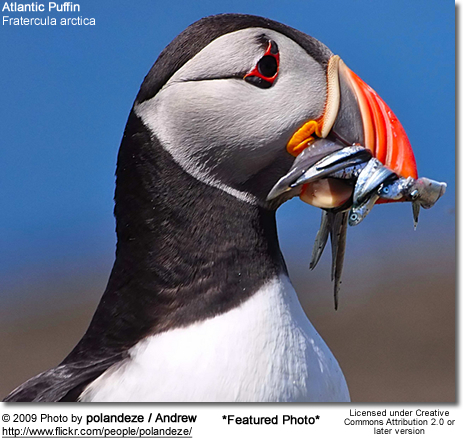 Puffins collect several small fish, such as herring, sprats, zooplankton, fish (shellfish), sand eels, when hunting. They use their tongues to hold the fish against spines in their palate, leaving their beaks free to open and catch more fish. Puffins normally line up the fish in their bills with the heads facing alternate ways. Additional components of their diet are crustaceans and mollusks. A puffin can sometimes have a dozen or more fish in its beak at once. The population of these birds was greatly reduced in the nineteenth century, when they were hunted for meat and eggs. Atlantic Puffins are still hunted and eaten, but this does not affect populations compared to other threats. On the Faroe Islands, for example, the birds may be hunted for local consumption after breeding is finished, when excess birds are available. On the other hand, puffin numbers increased considerably in the late twentieth century in the North Sea, including on the Isle of May and the Farne Islands. Numbers have been increasing by about 10% per year in recent years. In the 2006 breeding season, about 68,000 pairs were counted on the Isle of May. However, Iceland has many times as many breeding pairs with the Puffin - lundi in Icelandic - the most populous bird on the island. In 2008 declines were reported in the Farne Islands and Isle of May colonies. 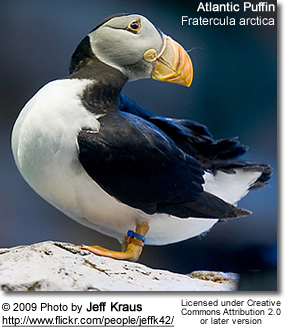 Since the Atlantic Puffin spends its winters on the open ocean, it is susceptible to human impacts such as oil spills. If an accidental oil spill occurs and pelagic birds are exposed, toxins are inhaled or ingested which leads to kidney and liver damage. This damage can contribute to a loss of reproductive success and damage to developing embryos. Oil spills may also have indirect effects. The Atlantic Puffin and other pelagic birds are excellent bioindicators of the environment because they are near the top of the food chain in the ocean. Since the primary food source for Atlantic Puffins is fish, there is a great potential to bioaccumulate heavy metals from the environment. Heavy metals enter the environment through oil spills - such as the Prestige oil spill on the Galician coast - or from other natural or anthropogenic sources. In order to determine the effects on pelagic birds such as the Atlantic Puffin, quantifiable measurements must be taken. In the field, scientists obtain contaminant measurements from eggs, feathers or internal organs. Since the Atlantic Puffin gets the majority of its food from diving it is important that there is an ample supply of resources and food. Different environmental conditions such as tidal cycle, upwellings and downwellings contribute to this abundance. In a study published in 2005 it was observed that Atlantic Puffins were associated with areas of well-mixed water below the surface. This study implies consequences for the species if impacts of global warming lead to an alteration of tidal cycles. 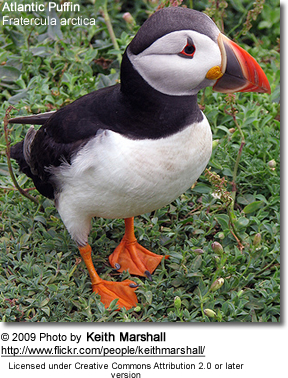 If these cycles are modified too much, it is probable that the Atlantic Puffin will have a difficult time locating food resources. Another consequence of an increase in temperature could be a reduction in the range of the Atlantic Puffin, as it is only able to live in cool conditions and does not fare overly well if it has to nest in barren, rocky places, and an increase in temperature could thus squeeze the zone of puffin-suitable habitat as warmer biotopes expand from the equator but the polar regions remain barren due to lack of historical accumulation of topsoil. The Norwegian municipality of Værøy has an Atlantic Puffin in its coat-of-arms. 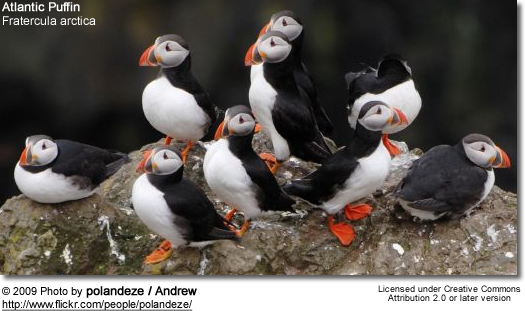 In August 2007, the Atlantic Puffin was proposed as the official symbol of the Liberal Party of Canada by its deputy leader Michael Ignatieff, after he observed a colony of these birds and became fascinated by their behaviour. SOS Puffin is a conservation project based from the Scottish Seabird Centre at North Berwick to save the puffins on islands in the Firth of Forth. Puffin numbers on the island of Craigleith, once one of the larest colonies in Scotland, with 28,000 pairs, have crashed to just a few thousand due to the invasion of a giant alien plant Tree Mallow which has taken over the island and prevented the puffins from accessing their burrows and breeding. The project has the support of over 450 volunteers and progress is being made with puffins returning in numbers to breed this year. More information is available at www.seabird.org.